The fish tank coffee table is a stunning piece of aquarium furniture that’s brimming with life. With swimming fish in a natural underwater setting, this piece of furniture is nothing short of exotic. A piece of captivating ornamental furniture, it makes a wonderful conversation piece and a centre of attraction in the living room. Being a versatile item, it can be used in many more ways asides as a centre table in the living room. It can serve as a display unit to hold small collectables, set in a niche as a side table for an accent chair, or as a part of an outdoor living space or patio furniture. 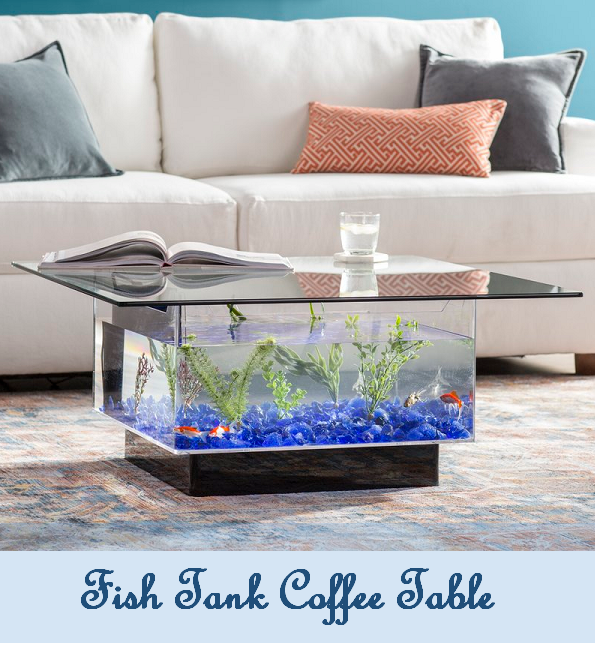 This aquarium coffee table, the perfect pick for contemporary and modern homes desirous of a more unusual piece of furniture, is a 25-gallon (100 pounds) fish tank with a sleek removable top made from chip-resistant shatterproof glass. The tank is crafted from UV-resistant acrylic casing that sits on a base that features a fluorescent light that illuminates the fish tank from beneath. The fish tank that can contain any breed of freshwater fish has some therapeutic benefits. It is soothing, great if you meditate, it is captivating enough to renew your energy, and has the ability to make you happy. The aquarium coffee table comes with heating, rocks, a pumping machine, lighting, some plants, and a plug-in power source. It, however, comes without freshwater fish. Those you will have to buy to complete the tanks function. This piece of furniture will become the centre of attraction in your living room. A great interior decorating idea that is a real show stopper.